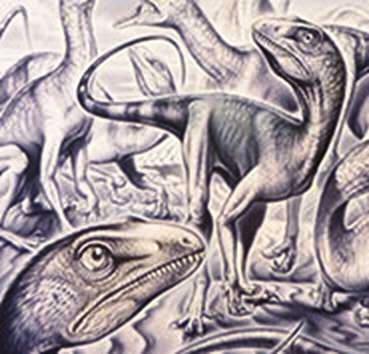 The Tytherington Dinosaur – the village's first resident! Thecodontosaurus was discovered in a quarry in Tytherington in the 1970’s when the M5 motorway was under construction. The quarry was being used to provide the rock for the foundations of the motorway and it also provided palaeontologists with new material for study after many original dinosaur bones found in a quarry in 1834 on Durdham Downs in Bristol and stored in Bristol Museum were destroyed during the second world war. It is usually referred to as the Bristol Dinosaur. The dinosaur's scientific name, Thecodontosaurus antiquus, means ‘ancient socket-toothed reptile’. It lived around 210 million years ago when the area where Tytherington now stands was part of one of a number of warm, tropical islands known as the Mendip Archipelago, a little like the Caribbean or the Seychelles today. Thecodontosaurus was a small dinosaur, 2.5 metres long (about the size of a medium sized dog such as a Labrador with a long tail) with powerful back legs and smaller front legs. It is one of the most primitive dinosaurs in the world, lying at the very base of the dinosaur family tree, and walked around on all fours reaching up into the trees with its front legs, using its claws to grab hold of the stems of prehistoric trees known as cycads. Its small sharp teeth, each with tiny sharp bumps running along one side, were like knives able to tear through thick, juicy leaves. During the Triassic geological period the kangaroo-sized Thecodontosaurus lived in small herds, with the male animals being larger than the females. 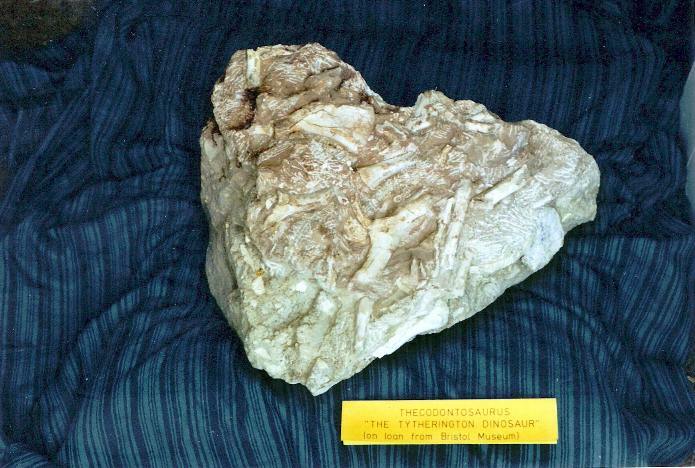 The fossils of the Tytherington Dinosaur (sorry Bristol Dinosaur!) can be found in Bristol Museum.